The second of the Imprisoned Heralds set reviews, this time focusing on Uterra, featuring Eon, Charlou and Fourthorder. Simple vanilla creature, pretty good underdrop stats in draft, not exactly a card you really want to level however, due to its low health. Decent pick in draft, but nothing to get excited about. Decent draft creature which is neither very good or bad, follows the rule of 6. Will not see constructed play, even in Dinosaur decks. Seems a bit dull to me, and will probably not see any competitive play outside of draft, in which it has the potential of trading well or at least decently. A very odd card that gives an extremely high amount of health to a creature in level one, but scales poorly. Giving yourself a gimped Druid's Chant is nice versatility, but it ultimately feels ineffective for the same reason Chant did: It doesn't affect the board in most cases. First life-gain card which can target either a creature or a player, could have seen play in the meta with Wegu, but others spells heal you way better. Doesn't scale well as well. Very situational in draft. I really think it could have seen play with Wegu, if it had better scaling. Might be good for a two for two if you have like a hand full of levels ones but other than that I see no potential in this card. If it had both heals I could see it becoming a thing similar to Vyric's Embrace. Roaming Warclaw is a good draft card and can see play in constructed, especially with the Upgrade mechanic, thanks to the token it creates and decent body. Decent underdrop in draft, the small token can set up for great Upgrade plays or just an extra block. and thanks to his dinosaur heritage he can even bask in the glory that is Uterradon Rex. but will probably not see any play in Standard, but might become an odd card in Unheroic. Enrage on a body that fulfils Upgrade. Not stellar in draft, but its an acceptable pick that goes up in value as you draft more cards that benefit off the replace, would never see constructed play because there are simply better options. I think it can enable some fancy plays in draft, maybe some in constructed with Bramblewood Tracker or Oreian Scavenger who would become a monster with both its Upgrade and pump. I would rather have seen this card as a transfer current stats to the card that overwrites it but hey whatever. Can make some plays with Bramblewood Tracker, but other than that I think it just something that you will ever see outside of draft. Average draft body with a ability that doesn't affect the board makes it a third rate pick in draft, although it can help stall for a bit as you're likely to get at least one heal off. Good card in draft with decent stats, the proc at end of your turn makes you sure to have value out of it (if you are using life-gain). Could see play in constructed but his stats aren't much better than Glowstride Stag, who heals better and hence grows the hated Wegu more. Decent stats and trades well. Effect is only relevant for life-gain decks and draft decks. As long as Stag survives blocking, if at all, you are always guaranteed one proc which might save you one turn from death and let you win. One of the ways you can make an absurdly large Venomdrinker, decent amount of poison at level one, and while it doesn't scale too well, multiples of them in the same hand is to die for. Also is synergistic with Soothsayer Hermit, potentially allowing you to fire up to four Venomstrikes in one turn. Not much to say, can make some sweet combos with Soothsayer Hermit, good amount of poison at all levels. A one of in your hand it feels pretty useless, but multiple copies make it bonkers if you can also play a Venomdrinker. it also has great synergy with Venomous Netherscale. This card will see play in poison decks without a doubt but probably not outside of that. Spiritstone Druid is the kind of card that is super flashy and cool, but given that the size of the spirits are really small, especially at later levels, and given that you have to consider 3 lanes to play this optimally, it can be awkward. Has notable synergy with Spring Dryad, as it can lead to four separate procs. So Spiritstone Druid, mediocre card which will see situational play, I don't pick it over a lot of stuff in draft, will not see constructed play as its not good without Upgrade. Below average body, but the effect is awesome, which if you get the tokens could be considered a 8/3 or a 8/6 that is more susceptible to AoE damage. This is one of the cards that you will be wanting in an upgrade deck in my opinion, but since the size of the body is kind of tiny I don't think it will see a lot of play. A draft card with a solid level body one but lacklustre level two and three, has amusing synergy with Sigmund Fraud, but otherwise notable for its body and not its ability. Tuskin can set up fancy plays (imagine a life-gain deck with the mighty Crypt Conjurer and Soul Harvest? ) but you won't ever have a lot of value out of it. Tuskin works great with Sigmund Fraud, but the token is so small that outside as a great sacrifice target it has little to no use since it spawns in a random open lane. Stats on the keeper are great and will trade well. this card will probably not be used in a deck that has no life-gain outside of a draft deck (only because of his stats). 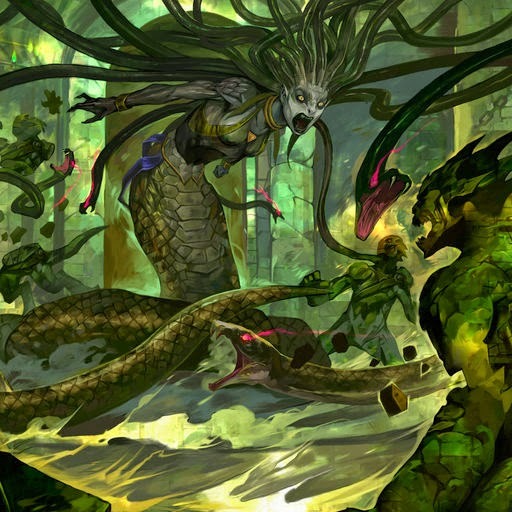 While I love poison to death and want to see it be hyper successful, Venomdrinker, while able to grow to a monstrous size without having to level it, it requires so much set up that you usually wish you had 3 plays to poison them all and then drop this baby. Doesn't happen often though. Niche card which is bad in draft and can mostly work in constructed with a poison deck and Lash of Demara. Can grow really large, and you can use it with Bramblewood Tracker in the right shell since the bonus doesn't scale with the level of the card (which could have been really fun). Could have been interesting to see it get Breakthrough after drinking some poison. The Ferocious Roar of draft, its actually pretty decent for several reasons, draft games can drag on forever and this just grows more powerful over time, secondly, its a card that you don't have to level that can have great effect. A decent pick up in draft, will not see constructed play simply because Ferocious roar exists. An unheroic roar which can only be used post level two and with a grow wide deck. Like all the 'rank X' cards in the set, a situational card that could see play either in draft as a one of or in unheroic. I don't like this card, it is as effective as a level one Ferocious Roar 1 if you are in rank 2, but on rank 1 its a measly +1 health +1 attack. but considering that you are buffing all your creature that are in play this card can't really get buffed better than it currently is. I rather have a regular roar in constructed than this, although Soothsayer Hermit is the only reason it might see play. It has an extremely apt name. its big, 8/8s aren't featherweights, its bad and while it might not be terrible, he lacks a niche. Its purpose in a BDA deck is redundant, as every card in that deck is already big and dumb, and there are arguably, better underdrops in Scatterspore Eidolon. Still, ok but not high pick in draft, probably will not see constructed play as it lacks a role. First consistent card at level one, similar to old Deepbranch Prowler, there are a bunch of creatures who are not that much smaller at level one and scale better. It will see very little play in constructed and I would pick a lot of other cards over it in draft. As a child Bartok was the best of his class, but over the years the rest of his classmates caught up and he was only slightly above the average of the class, as time went on everyone except Timmy surpassed him in class, but people still hang out with him for the memories and drive that he gave them. A card I like to compare to as the Brightsteel Gargoyle of draft, as it just refuses to die and gains you incremental value as it respawns kitfinitely. Stats make it suited to not dying in one swing, but low attack makes it only chip at most cards. High pick in draft, may see niche play in constructed with Upgrade maybe. The heroic gargoyle, can be really annoying, but it loses all the buffs when replaced. Some good plays in draft, only will see play in constructed with the Upgrade mechanic. Lack of attack power makes it slightly worse. Stats are nothing too terrible, since it mostly trades at all levels. Its main power comes from the fact that if you overwrite it, it spawns a fresh Sprite in one of your open lanes. Though it will only see play in draft and upgrade decks this card is still a great addition to the list. Also in the loving memory of the oneandonlykit. An absolute favourite of mine, improves your deck's consistency and makes your available plays even more flexible, decent body make this an extremely high pick in draft, and a constructed staple. Hermit is a top pick in draft, as it can really helps you to improve your consistency if it's on levelled. Has a similar mechanic to Killion if you missed a card, but you will have to play that card to gain value. Would have loved to see a mediocre card who allows you to play a free card after playing Hermit. Can see play in constructed for some very specific purposes and his good stats. This card is not a hermit, he always tries to bring something with him if they missed it. this is also the reason that you can plan crazy plays. and with his stats he is nothing to laugh at. this card will see play, especially in draft. Hermit: oh you missed the bus, well at this bus stop you might be able to catch it. Very cool card with poison deck and Venomous Netherscale, the level three's activate is not that beastly but with poison ticking on it, the creature should soon die. Level alongside with Netherscale and see your opponent's creatures writhe and die in pain. Note: Fourthorder may be slightly biased towards poison. *looks at Druid's Chant, sighs* Well this is the card that makes that junk viable. Are you happy now, SBE? Anywho, its a major win condition in life-gain decks that essentially puts your opponent on a two turn or even one turn clock, growing extremely quickly to appropriate life-gain. If 1-for-1ed with hard removal however, the deck kind of falls apart. The card induces a lot of variance, and while I personally don't think it needs a nerf because its too strong, I'll love to see it banished into the deep dark oblivion as it is personally anti-fun to play against. Wegu is the absurd card of the set, and there is just not many downside of it. Having an aggressive deck which doesn't fall off late and being able to consistently go 1 for 1 for a Wegu is one of the key ways to beat it. Wegu loves life-gain and makes some previous trash cards workable. Because of my hate for this card i refuse to analyze it, but this card will [redacted] your defeat if let be.